I did a search, but it didn't really notice a catch-all thread for this. I'll bet there's one out there, though, so my apologies. Also, I wasn't sure if I should ask this here or in the "pics and vids" forum, so please move it there if that's more appropriate. Anyway, I've got my first kite on the way (thanks Steve), and I've been spending quite a bit of time boning up on what not to do when it arrives. I'm sure I'll have a million questions once I actually get in the air, but in the meantime, I'd love to see some collection pics you all may have. Specifically any Limited Edition or discontinued stuff out there. While I've never actually flown a dual line before, I am a chronic collector. In other words, when I get into something, I don't just do it, I live it! Be it skateboarding, action figures, space memorabilia, whatever, I just LOVE stuff! I've only been looking into the hobby for a few weeks now and I already have my eye on BUNCH of other kites. Most of them I have no business owning at this early stage, but like I said, I get hooked easily. One the top of my wish list is the red Zephyr from 2010. I'm also aware of the eggplant as well as the pink Q-Pros, the E2, Mirage, and all the Blue Moon stuff, but I was just curious what other goodness I've missing out on. In short, make me jealous! And it's great to meet all of you! Revolution has their Master Piece collection that may interest ya. Prism Ozone... a must have light wind kite. Standard and Vented Illusion. Discontinued, but fun to fly when the mood strikes. Some of my favorite discontinued and custom kites. I fully understand the collector thing, I wish I had more time to fly all my kites. That rainbow E2 is gorgeous! It flies better than any other E2 that I've flown, too. I think the previous owner knew how to tune it. I think it has to come out & fly on the next good day, now. I see that's a Barry Poulter in your avatar as well, right? Is it from your personal collection? Great pics, RobB. I'm a sucker for anything primarily red/black, so I'm a fan of that Ozone by default, but that 2009 Berkeley E3 is SWEET! I'm not usually a fan of too many colors together, but the subtlety of the rainbow against the grey and black really pops. Thanks for sharing these. Ya i have both the E2 and the E3 i def prefer the E2...just need to install some yoyo's on it! You sir have one fine collection! haha. Looks like you have more than a few Collectors. This, believe it or not, was the very first Solus Prototype with the old graphics. ... I am a chronic collector. In other words, when I get into something, I don't just do it, I live it! Be it skateboarding, action figures, space memorabilia, whatever, I just LOVE stuff! 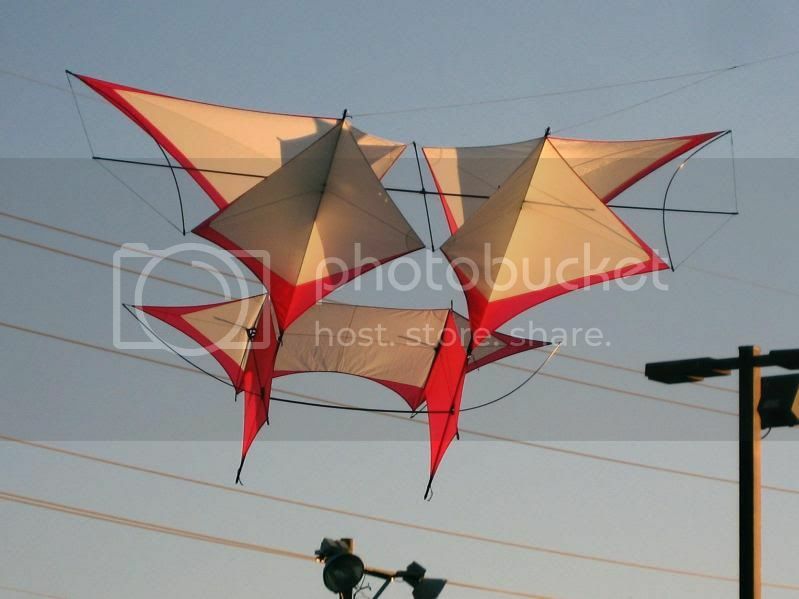 I've only been looking into the hobby for a few weeks now and I already have my eye on BUNCH of other kites. Most of them I have no business owning at this early stage, but like I said, I get hooked easily. You are going to love the Swap Meet here then, looks like more competition for the other collectors. Check often and pull the trigger quick, you'll notice there have been kites sold in under a minute when highly desireable. Good stuff, adx! I like that black/red/yellow Firebird a lot. @mikenchico: Oh yeah, I found my way. I was rummaging around in there all morning lying in bed. A few things caught my eye, but I think I better wait to see if I actually do like it, before I start living it. I should have a good idea hopefully by next weekend. I figure if I can keep the kite in the sky > 1 minute, not kill anyone, break (too much) of anything, and then actually return home with the kite itself and not a picture of it stuck up in a tree, I'll consider adding more to my collection. Here's a limited edition 3D photo of the discontinued Mamba. That took a couple of hours to make in Photoshop. 1 of 1, I was lucky enough to get it. @chilese: After an hour of oogling that "2004" album, I'm still only half-way through it. Some of those Revolutions are simply stunning. I'd kill for that dual-headed Randy Tom. I've been a Nagel fan since seeing the Rio album cover back when I was a kid. And that rising sun Vader is just amazing. @st3307: Hell yeah that fits the bill! Man, I'm really liking a lot of these designs more than I thought I would. The reason I say that is it looks like most kite graphics use A LOT of rainbow elements and contrasting colors, both of which I'm not really a fan. Normally I gravitate towards darker colors in almost everything I do. Cars, clothes, bags, sneakers, my personal websites, even the way I decorate my living space. Yet, after my initial snobbery, I'm finding myself strangely attracted to some of the bolder kites after all. @ainokea: Crazy! I don't think I've seen one quite like that before. Truth be told, I haven't really seen many kites in the the sky in person. Some of them I can't even imagine how they're able to stay up there in the first place.? !